The brakes emit a squeaking noise when applied. 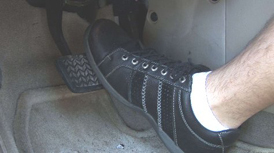 Brake squeak can be caused by worn pads or uneven braking surfaces between the pad and the brake rotor. The brake pad is equipped with a metal wear indicator that contacts the brake rotor when the pads become worn beyond their useful service life. This wear indicator is designed to emit a high pitched squeak when it contacts the brake rotor to indicate that brake service is needed. If the brakes are severely worn, the indicator may contact the rotor at all times emitting the squeak even when the brakes are not applied. A visual inspection of the brakes will indicate if brake service is necessary. If the pads are worn to the wear indicator, replacement will be necessary. If the pads still have a useful service life left, an anti-squeak compound may be applied to the backside of the pad (metal side). When replacing the brake pads it is recommended that the brake rotors be machined (often referred to as surfaced or turned). This will provide a flat mating surface for the new pads which will prevent brake squeal. A high quality anti-squeak compound should be applied sparingly to the back side of the new pads. Some vehicles use metal shims between the pad and the caliper. These shims should be replaced or cleaned and re-installed. Brake rotors become extremely hot after vehicle operation and braking. Use caution when working on the braking system. Brake rotors have a manufacturers minimum thickness. Never machine a rotor beyond the minimum thickness. This will only contribute to warpage since the rotor cannot adequately dissipate the heat generated during braking. The minimum thickness is usually stamped on the brake rotor, usually on the back side. The brake rotor should be replaced once it has reached or has become thinner than its minimum thickness.